The future of 3D printing, it seems, is in multimaterial filament printers. The Prusa I3 multimaterial upgrade exists, and this weekend at MRRF E3D announced their amazing multihead printer. Multimaterial printing will get you mechanical parts with the properties you want, like wheels with grippy treads and strong hubs. It will give you easily removable support material. The most popular use, though, is bound to be multicolor prints. It’s easier to do, as you’re really only working with either ABS or PLA, and if you’re really clever, you can squeeze everything through a single nozzle. While there are some very ingenious ways of printing in multiple colors of filament, one technique that hasn’t gotten a lot of attention is automated filament splicing. With this, a piece of software analyzes a model, and combines multiple spools of filament into one long strand. A machine that’s getting a lot of attention is the Palette+ from Mosaic Manufacturing. There were a few of these on hand at this weekend’s Midwest RepRap Festival, and here anyone could get a hands-on with this machine without spending $800. When it comes to multicolor and multimaterial prints, the first question that comes to mind is the toolchain and the process of turning an STL file into a physical object. The Palette+ uses a piece of software called Chroma that takes STL files as its input. Each color in the object to be printed is actually a separate STL file, combined on Chroma’s build platform. The Charmander print shown above is actually four different prints; the white eyes are one STL, the orange body is a second, the yellow belly is a third, and the red flame on the tail is a fourth STL. In the Chroma app, these STLs are assembled, colors are assigned, and a file generated that’s stored on an SD card and shoved in the Palette robot. The Palette then assembles a custom length of filament with the right colors in the right places. Combine this with some G-code from your favorite slicer, and you have everything you need for multicolor printing with the printer you already own. The results are fantastic, and the best I’ve ever seen from a multicolor filament-based printer, whether it’s a dual-extrusion head, Prusa’s Multimaterial upgrade, or a bizarre machine with multiple toolheads. Of course, there are downsides. Because the Palette is designed for single-extruder printers, you’re not going to be able to combine ABS and PLA filament. Combining fancy engineering plastics and colorful PLA is right out. This is a machine that can only use one type of plastic at a time. That said, we’re getting very, very close to an era of true multicolor printing. Of course, this machine costs as much as a good 3D printer, but if you just want to print some colorful blobs of plastic, I haven’t seen anything better. E3D has introduced their latest answer to multimaterial printing at the Midwest RepRap Festival this weekend. Their research project into a 3D printer with the ability to change toolheads is the latest advancement in multimaterial printing. It’s a work of engineering brilliance, and they’ve already written up their teardown on how this all came to be. While milling machines and other fancy industrial CNC have had tool changing for decades, and the subject has been pursued by the RepRap community for a few years now, it really hasn’t caught on. The question then is, what is tool changing on a 3D printer good for? The answer is multimaterial printing, and doing it in a way that doesn’t have the downsides of current methods of printing with multiple materials. There are three current methods of printing in multiple materials. The first is putting two nozzles on the same extruder, but this has the downside of one nozzle interfering with the other. The second is pushing two different kinds of plastic through the same nozzle, such as in the E3D Cyclops, or Prusa’s multimaterial upgrade. This has the downside of cross-contamination, and you can’t print in materials that require different temperature profiles. The third method is simply using multiple carriages on the same machine, such as the lovely stuff from Autodesk or Project Escher. This last method is horrifically complex. The answer the problem of multimaterial printing is hot-swapping toolheads, but to do this you need precision and repeatability. The folks at E3D have been working on this for years, and I remember seeing some experiments with electro-permanent magnets a few MRRFs ago, but now they finally have a solution. The answer is simply a cam that’s turned by a cheap hobby servo. This is kinematic coupling that allows the carriage to clamp onto a toolhead with 5 μm precision. Right now, E3D’s experiments in toolchanging 3D printers have culminated in a single 3D printer featuring their toolchange carriage, four toolheads, some amazing linear rails, and a CoreXY configuration. The prints that are coming off of this printer are spectacular. There are four-color Benchies, and the drivetrain of a remote-controlled car with gears printed in Taulman plastic and a driveshaft printed in ABS. The car was a single print made with multiple hotends, demonstrating most of the problems of multimaterial printing disappear with the E3D swapping toolhead printer. If you’re interested in purchasing one of these printers, E3D currently has a survey for potential buyers and a deposit queue for any future purchases. As reported by [Patrick Tucker] of Defense One, a radical new laser-powered sonic weapon was shown off at the “Directed Energy to DC Exhibition”. The system uses two lasers: one to generate a ball of plasma when it hits the target, and another to modulate the plasma ball in open air. The result is a variation of the classic plasma speaker demonstration, where plasma is used as a a driver for a massless speaker. Currently the system is capable of generating a deafening crack at the target area, with a measured intensity as high as 140 dB. That’s about as loud as fireworks or a shotgun going off at close distance, and in theory is enough to drive off whoever is unlucky enough to be targeted with the beam. In time, the researchers hope to refine their secondary modulation laser to the point that they can play audio over the plasma. This would allow the beam to be used as a directed loud speaker of sorts, which could prove useful for defensive applications. Only the target would be able to hear the audio, which could be a recording telling them they were entering a secured area. A disembodied voice telling you to turn around sounds like a extremely effective non-violent deterrent to us. The voices in our head don’t have to tell us twice. 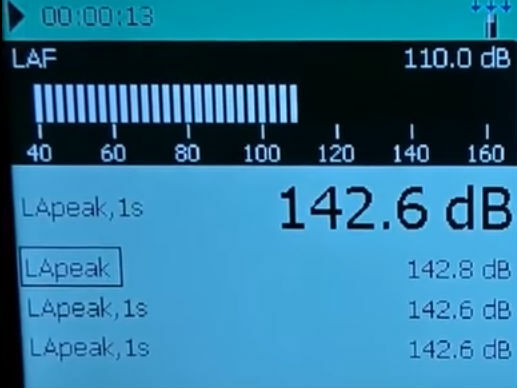 We recently looked at the possibility of targeted sonic weapons being used in Cuba, and of course, we’ve covered many plasma speakers on Hackaday over the years. Plasma speakers have always been more or less nothing more than a fun high voltage demonstration, so to see them potentially weaponized is a crossover episode we weren’t expecting.